Hutong is an ancient city alley peculiar to Beijing. Beijing has more than 4,550 Hutong. Those surrounding the Forbidden City and taking Prince Gong's Residence as the center are the best-preserved. The buildings in Beijing hutong are mainly compounds with houses around a courtyard, also known as quadrangles. Narrow passages between these quadrangles linked one with the other are hutong. The hutong in Beijing was mainly formed in the Yuan (1279-1368), Ming and Qing dynasties. 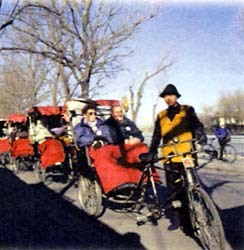 Tourists may have a tour of the 700-yearold hutong in Beijing by tricycle.